The battle for smartphone device supremacy is all the way headed in 2012 with Apple and Samsung slogging it out. Nokia which was the market leader till 3 quarters back has now been pushed back to 3rd spot on the market shares. While Apple managed to sell 37 million iPhones in Q4, 2011, Samsung managed to edge out Apple as the year’s top smartphone manufacturer. Samsung played to a portfolio strategy and advanced in 2011 because of its strategy of offering a complete line of smartphone products, spanning a variety of price points, features and operating systems. The relatively small growth of Sony Ericsson and Motorola may indicate that the Android smartphone market is becoming too crowded as the various licensees compete for limited consumer mindshare and shelf space. With global smartphone shipments nearing half a billion units in 2011, Samsung is now well positioned alongside Apple in a two-horse race at the forefront of one of the world’s largest and most valuable consumer electronics markets. Nokia’s global smartphone market share halved from 33 percent in 2010 to 16 percent in 2011. A lackluster touch-screen smartphone portfolio and a limited presence in the huge United States market caused Nokia’s shrinkage last year. Nokia’s partnership with Microsoft will be very much in focus during 2012, and the industry will be watching closely to see how swiftly the two companies can expand in the high-value 4G LTE market that is rapidly emerging across the United States, Japan and elsewhere. The silver lining for Nokia was that a million Lumia’s have been shipped in 2 months since launch and Nokia has in over a decade has found some traction with US Operators with the Lumia. Apple ranks number one in terms of the global tablet shipments for the fourth quarter of 2011. 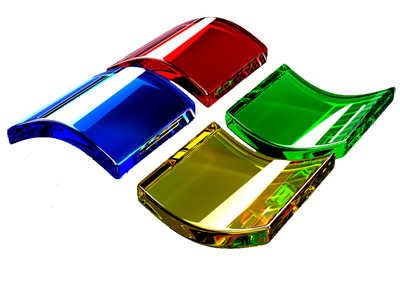 27 million tablet units were shipped in the fourth quarter of 2011. While the Apple iPad occupied a majority of the global market share with 58 percent, Android tablets recorded a 39 percent global share. 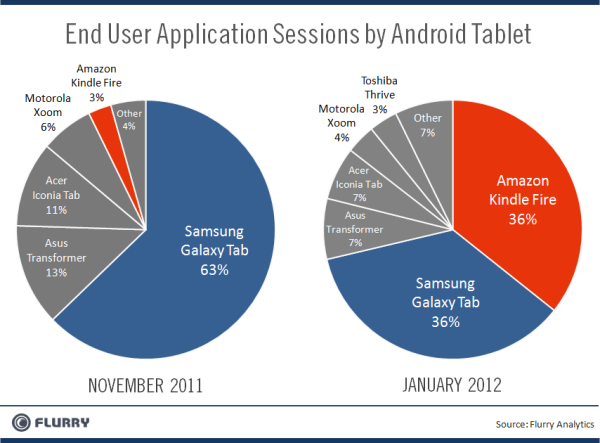 Android captured a record 39 percent share of global tablet shipments in Q4 2011, rising from 29 percent a year earlier. Global Android tablet shipments tripled annually to 10.5 million units. 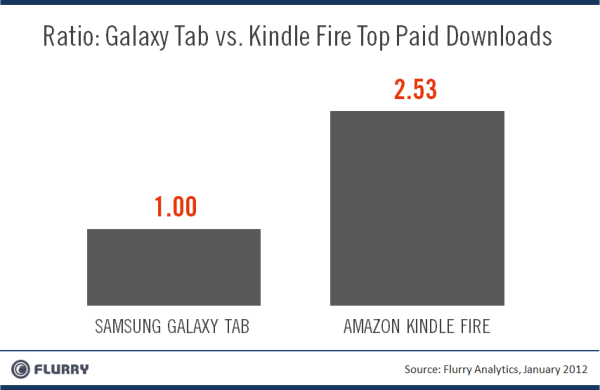 iSuppli estimates Amazon Kindle fire to be the second biggest tablet maker with 3.9 million units which establishes it as 14.55% of the global tablet shipments. Demand for slates has increased by 150 percent all over the world as compared to the figures that were recorded in the fourth quarter of 2010. 15.4 million iPads were retailed in Q4 2011. Even while there are many companies manufacturing tablets running on the Android OS, Apple has shown that its iPad, which has somewhat been the inspiration behind the whole tablet revolution, still maintains the top position. Another interesting finding that emerged from this Strategy Analytics study is that the amount of tablets shipped globally in 2011 was 66.9 million which is a 260 percent leap from the 18.6 million figure registered in 2010. Apple is predicted to become the first $trillion global company in 2016 and going by the momentum they seem to gather, it does seem very possible unless Apple becomes a victim of its own success. Apple sold 37.04 million iPhones, its flagship product, (representing 128 percent unit growth over the year-ago quarter) and 15.43 million iPad tablets (a 111 percent unit increase over the year-ago quarter). Apple posted a record quarterly revenue of $46.33 billion and record quarterly net profit of $13.06 billion. These results compare to revenue of $26.74 billion (73% increase YOY) and net quarterly profit of $6 billion, an increase of 117% in the year-ago quarter. Gross margin was 44.7 percent compared to 38.5 percent in the year-ago quarter. International sales accounted for 58 percent of the quarter’s revenue. Apple sold 5.2 million Macs during the quarter, a 26 percent unit increase over the year-ago quarter. Apple sold 15.4 million iPods, a 21 percent unit decline from the year-ago quarter.Apple’s cash and securities swelled to almost $100 billion. The stellar results only emphasise the point that 2012 is going to be a good year for Apple with the iPad 3 and iPhone 5, which are expected to add to the growth story. The growth momentum going into H1, 2012 should be driven by demand in China as well as the low channel inventories. While Apple reveals in its huge success and possibly takes the lead and momentum through to 2012, one question that begs to be asked is how long can Apple better its already unmatched stellar performance? Q1,2012 will be Apple’s China takeover story but what about Q4,2012? What device/devices will power YOY growth over a blockbuster quarter such as Q4,2011. Will Apple feel the strain of heightened expectations? Will it miss its god, Steve Jobs? Yahoo! has not delved into details regarding Jerry Yang’s exit.. It didn’t really have to. While Yahoo! remains one of the biggest draws on the web with about 600 million people visitors a month, but like AOL, that other dinosaur of the first era of the internet, Yahoo! has been left flat-footed as Google and Facebook emerged as the next generation of online leaders. Sales have fallen at Yahoo! since 2008 and Google and Facebook are taking an increasing share of its display ad business. The firm has cut costs and found ways to boost its profit margins and keep earnings up. But the pressure for change is on – and it shows. In 2008, Microsoft’s Steve Ballmer launched a $44.6bn (£28.8bn) takeover bid for Yahoo! but it was resisted, especially by Yang, and eventually the deal collapsed. Yang was the man who fought hardest to reject Ballmer’s offer. Yahoo! is currently worth about $19bn but now that Yang has gone, it may require a more radical fix. Yahoo! is still huge, but what is sort of company is it? They are not going to beat Google in search, or Facebook for the social network. They will continue to get ads because of their size, but if they are not seen as relevant – and they are not – the quality of those ads and the price paid will fall. In today’s environment, companies that are not seen as relevant are dead. Yahoo! is on its downward spiral. Yahoo! lost its way long ago. It’s big in news, sport, finance, email and it owns Flickr, the photo-sharing site. But somehow one of these sites add up to a whole. It will take a Steve Jobs to turn Yahoo! around. Someone needs strips it down to the core before building it back up again. Yahoo! recently appointed a new chief executive, Scott Thompson, former boss of eBay’s online payment company PayPal. He replaces Carol Bartz, acrimoniously ousted by a board she dismissed as doofuses. Given the firm’s shoddy record with bosses, she might have had a point. But so did they. Bartz’s strategy – trim costs, sack people, sell stuff – did little for Yahoo!. According to comScore data, the number of minutes that US website visitors spent on Yahoo! sites during her two-and-a-half years as chief executive fell 33% while the stock price stayed flat. The big question for Scott Thomson is what is he going to do that’s different. 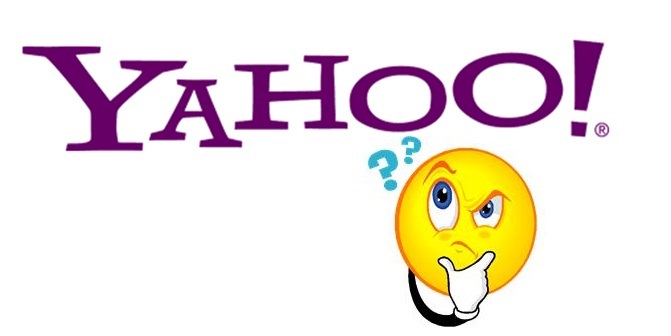 Thompson is likely to sell off Yahoo!’s Asian assets, a move many believe Yang was holding back.Yahoo! bought a 40% stake in China’s Alibaba in 2005 for $1bn. It was a great buy. Analysts calculate that the Alibaba holding, along with the company’s stake in Yahoo! Japan, is now worth $17bn. But what happens after that? Yahoo! is undergoing a “strategic review” and competitors smell blood in the water. Microsoft is reportedly looking at Yahoo! again, albeit at a far lower price, and private equity firms have been sizing it up. Jack Ma, Alibaba’s founder, has also expressed an interest and is tipped as a likely buyer for Yahoo! Japan and maybe more. If Yahoo! were to be acquired by Alibaba that would be the biggest Chinese takeover of a US company in history. Scott has the choice of turning Yahoo! around. However, that’s not really his skill set. The rumour in Silicon Valley is that he was far from the company’s first choice. Like Bartz, who came from a design software firm, Thompson does not have a media or advertising background. But if that doesn’t work, at least he’s a finance guy. He’ll know how to package this company for sale. With Yang gone, a sale of all or part of the business looks more likely. It’s what comes after this that worries. Yahoo! is one of the top sites in the world. That’s a lot of opportunity. But if it can’t redefine itself, it could be scattered to the winds. 1. Introduced in 2Q,2009, it has taken Android 10 quarters to come from a zero base to the best selling Mobile OS in India. 2. Android has an installed base of 3 million users in India. 6. 10 quarters after the launch of Android,in Q3, 2011, Android became the No.1 Smartphone OS in India beating a rapidly declining Symbian. Prior to Android, Indian Smartphone OS was polarized by Symbian which ran across smartphones from Nokia, Samsung, Sony Ericsson and LG. Barring Blackberry, other OSs such as Windows, Linux had never been market favourites really. 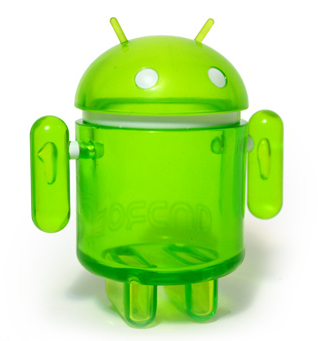 Android provided the much needed variety and option for Smartphone OSs in India. 7. Only a meager 2% of total Android activations in India have been CDMA devices. 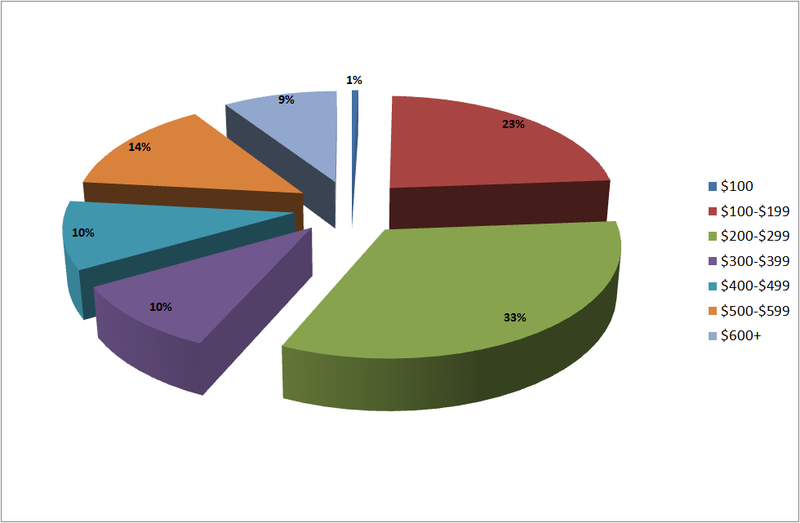 79% of CDMA Android devices are Samsung devices. 8. Samsung having sold 1.2mn Android devices is the largest Android seeder in the Indian Market. HTC follows with .93 mn 9. Android handsets sold. 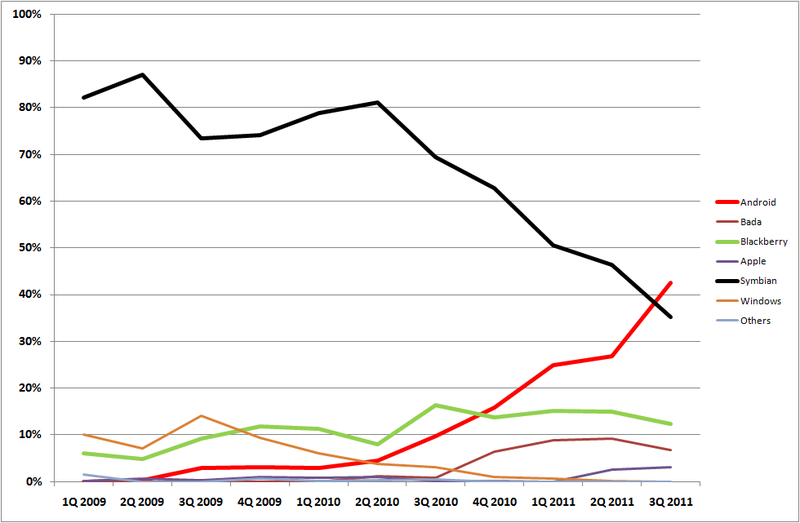 Sony Ericsson is a distant third with .43mn Android devices sold. 10.Both Samsung and HTC contribute 70% of the total Android sales in India. 11.Samsung, HTC, Sony Ericsson, LG and Moto contribute to 90% of the total Android sales in India. While a number of local manufacturers have tried to ride the Android wave, success has so far been limited. 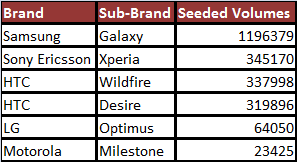 12.Sub-brands such as Galaxy, Wildfire, Xperia, Desire, Optimus and Milestone have contributed to 75% of the total Android sales. 13.As against the ASP of smartphone devices, Android ASP drop has been more aggressive. Android OEMs have been aggressively trying to position to newer categories of users, thereby increasing the audience, appeal and the numbers. 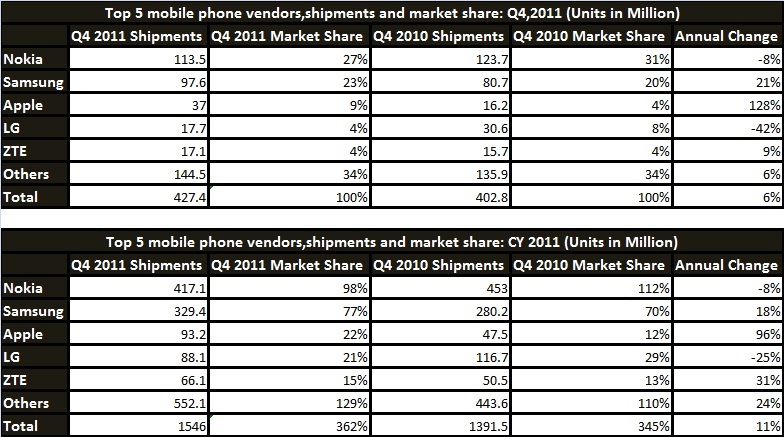 Between Q1,2009 and Q3,2011, Android ASPs came down by 43% while the overall smartphone ASPs came down by 19%. 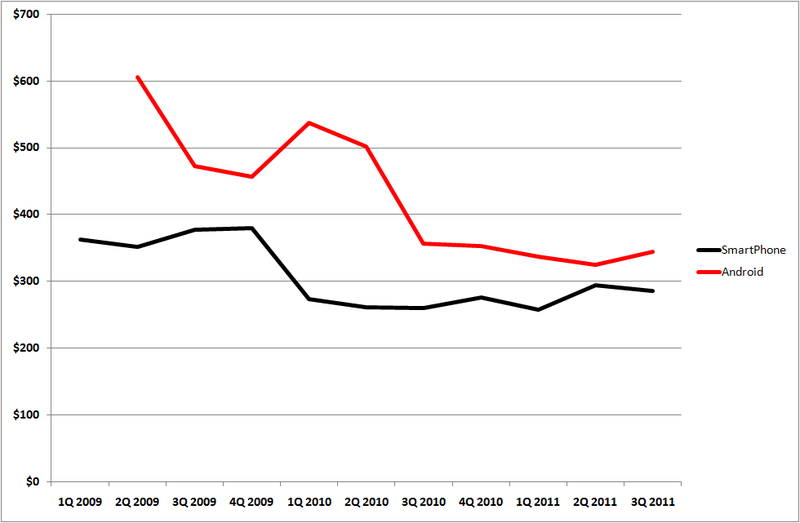 14.In the 7 quarter period, Q1,2010 to Q3,2011, Android multiplied sales by a factor of 41x. Corresponding ASP drops was 36%. 15. Mid end Androids have been the most successful in Indian markets with 56% of total Android sold belonging to the $100-$299 category. With Samsung testing the sub-10K price segment for Youth categories for Android, this category will accelerate in time sto come. 16. Interestingly enough a lot of local Indian brands tried riding on the wave of Android in lower segment but as stated earlier Android’s have been more successful when launched and marketed by the larger brands.